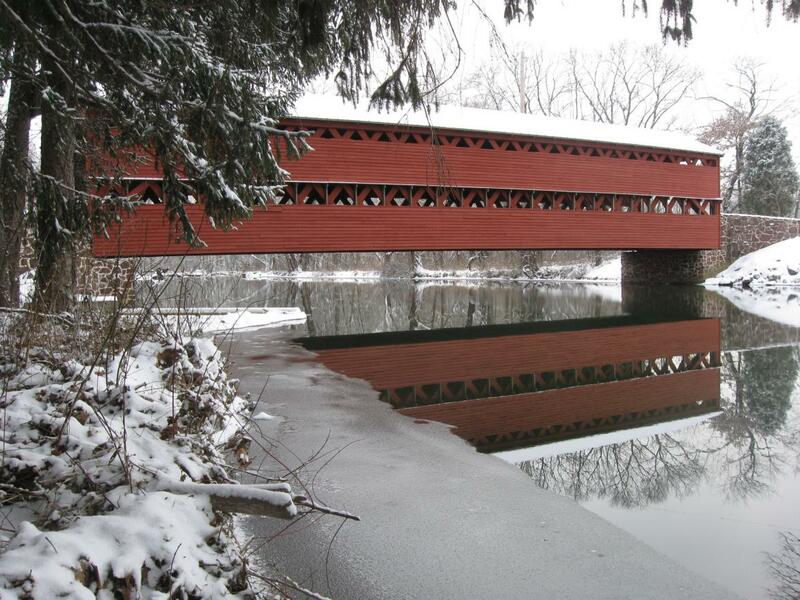 The Sachs Bridge, built in 1852, spans Marsh Creek. 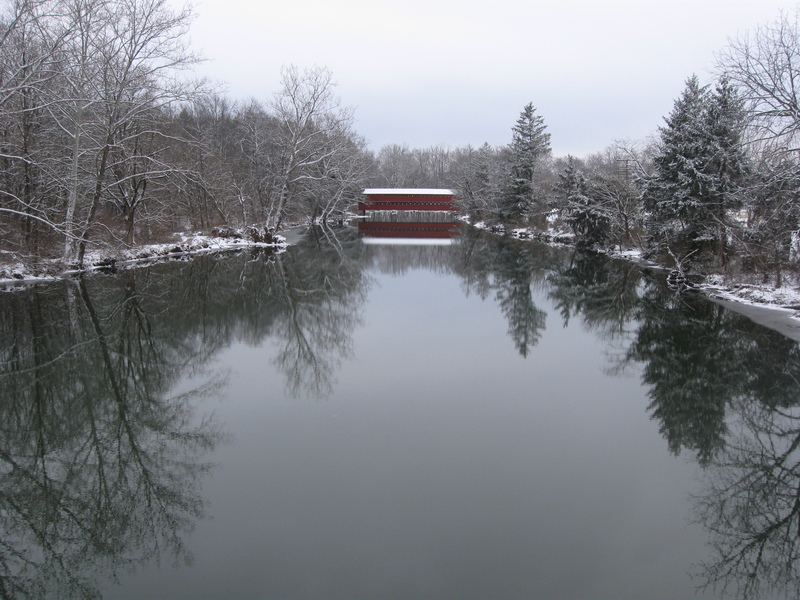 This view was taken from the bridge on the Millerstown/Pumping Station Road. This view was taken facing southeast at approximately 9:00 AM on Thursday, December 31, 2009. Yes we know we were supposed to stop showing you snow pictures, but it snowed another three to four inches on New Year’s Eve, and we wanted to show another Gettysburg location in a winter setting. 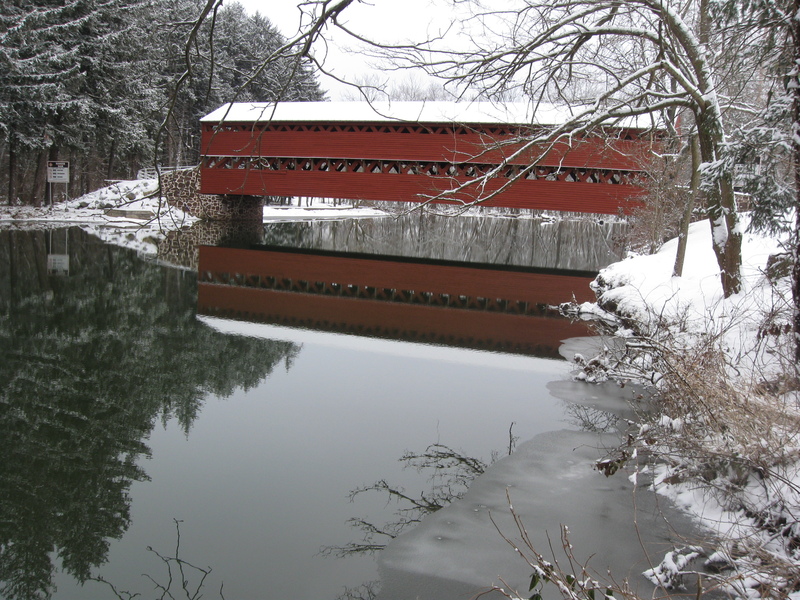 Sachs Bridge, is located across Marsh Creek, west of the Eisenhower Farm. 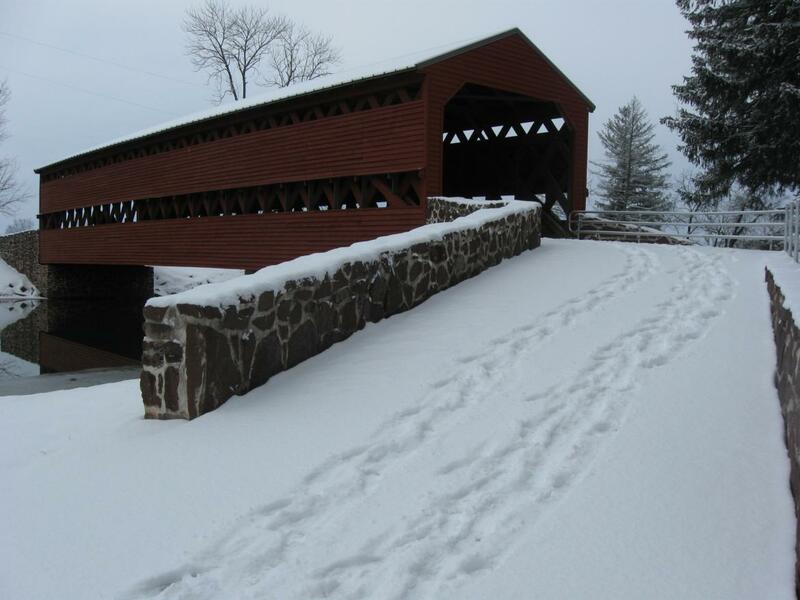 The Bridge was crossed by both armies during the Gettysburg Campaign. 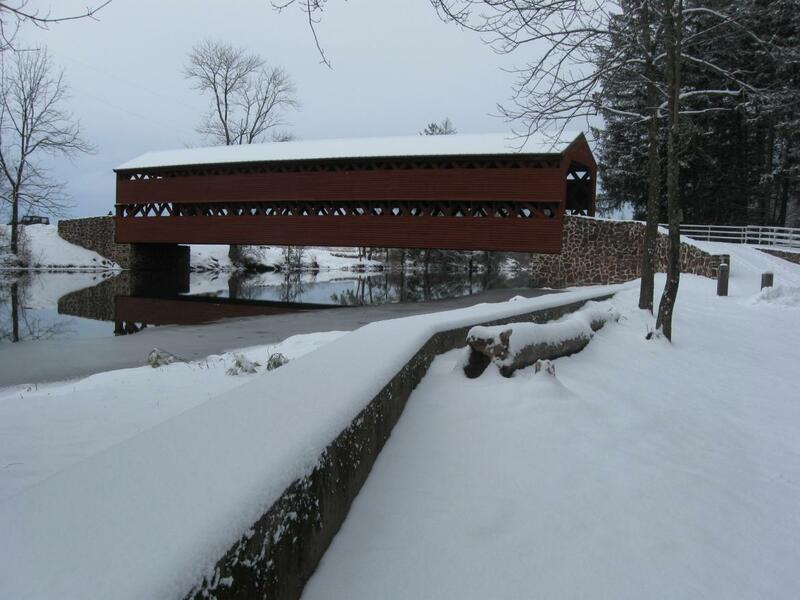 This view was taken facing northeast at approximately 9:00 AM on Thursday, December 31, 2009. 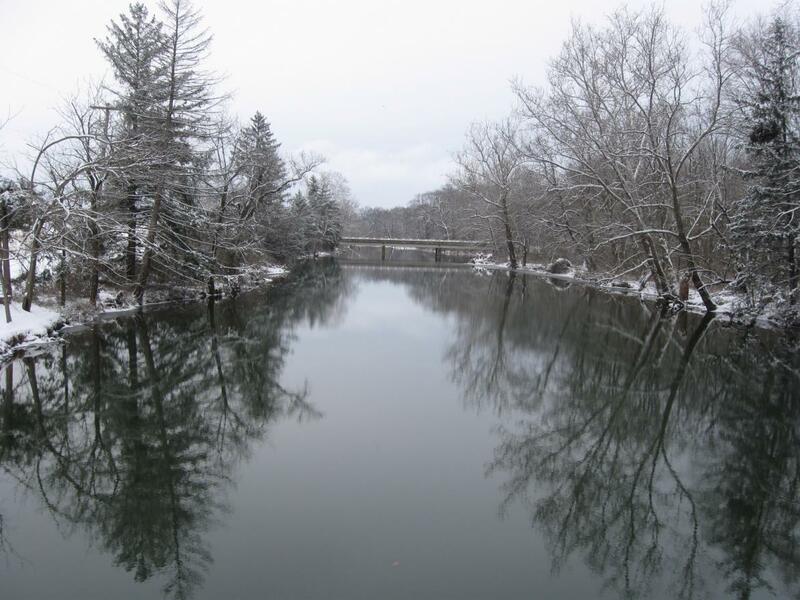 This view was taken facing northeast at approximately 9:00 AM on Thursday, December 31, 2009. 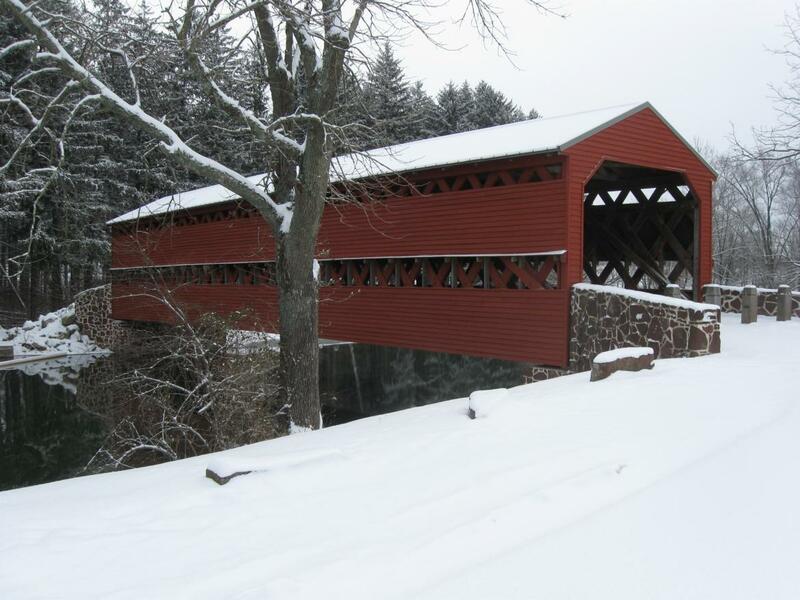 When it was originally constructed, its deck was supported by a truss and lattice system based on a design by Connecticut architect Ithiel Town. 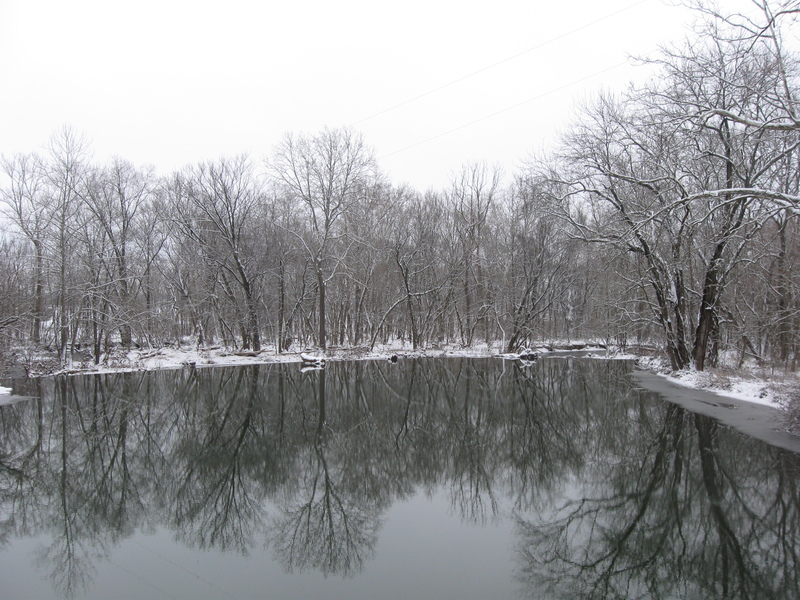 This view was taken facing northeast at approximately 9:00 AM on Thursday, December 31, 2009. 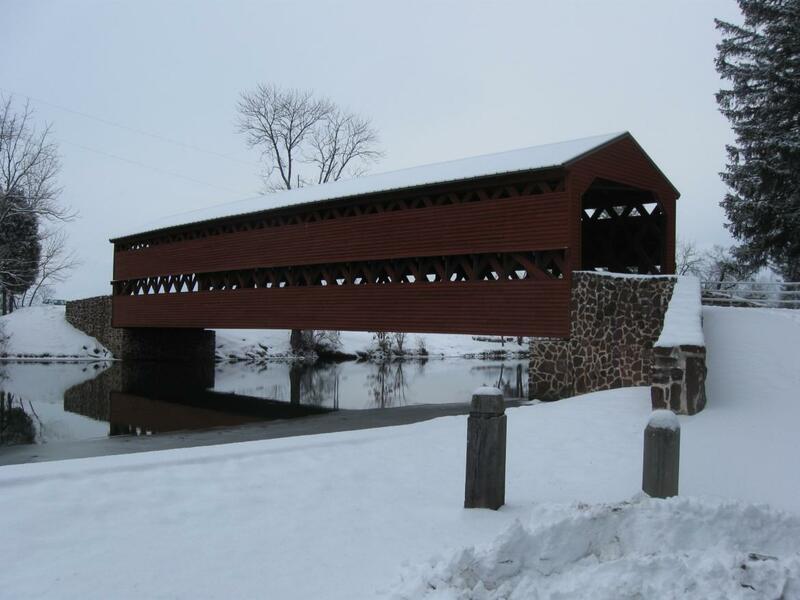 Town’s Lattice Truss design was important because it could be built quickly by relatively unskilled workers, such as the workers under David S. Stoner who built the bridge for Adams County. This view was taken facing northeast at approximately at approximately 9:00 AM on Thursday, December 31, 2009. 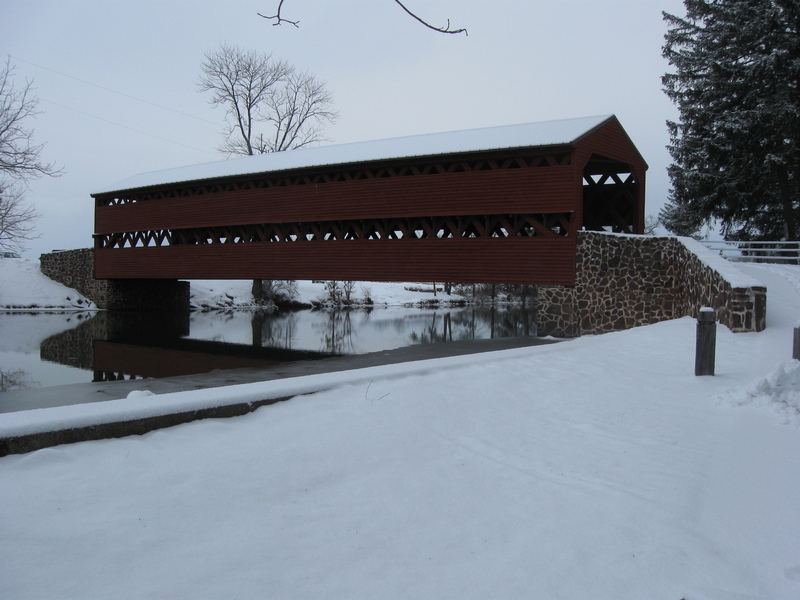 The Lattice Truss design also avoided the need for the wide piers needed for stone arches. The design was widely used throughout the United States and made Town wealthy. Town charged one to two dollars per foot in royalties for his designs. This view was taken facing northwest at approximately 9:00 AM on Thursday, December 31, 2009. Another advantage of the Town design was that the bridge could be made from readily available material. 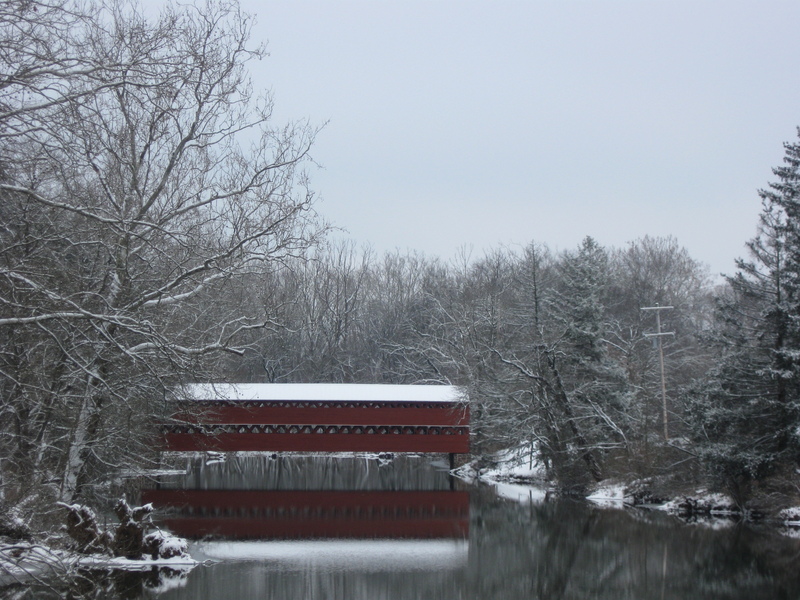 The Millertown Road/Pumping Station Road bridge spans Marsh Creek in the background. This view was taken facing northwest at approximately 9:00 AM on Thursday, December 31, 2009. This view was taken facing southeast at approximately 9:00 AM on Thursday, December 31, 2009. We’ve now crossed the bridge, and will walk toward the spillway/dam. This view was taken facing west at approximately 9:00 AM on Thursday, December 31, 2009. 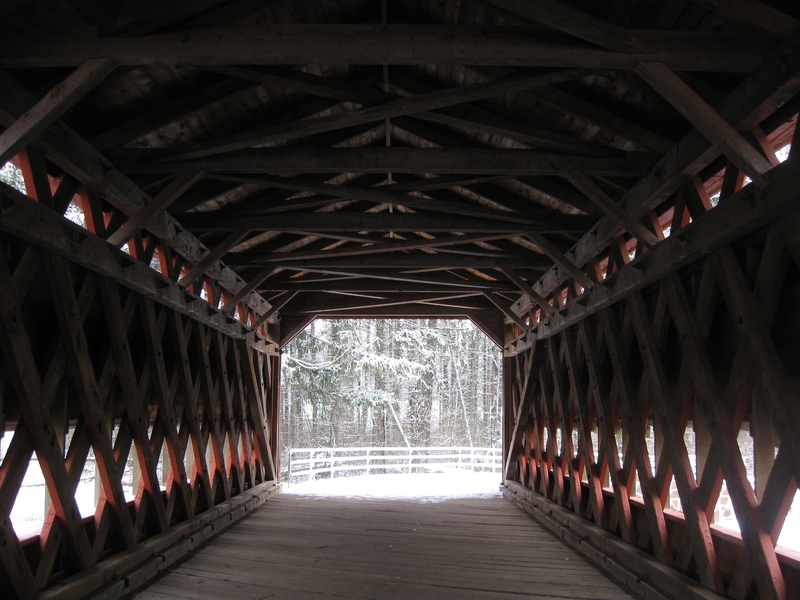 Uncovered wooden bridges tended to deteriorate rapidly from exposure to the elements, having a useful lifespan of only nine to fifteen years. This view was taken facing northwest at approximately 9:00 AM on Thursday, December 31, 2009. 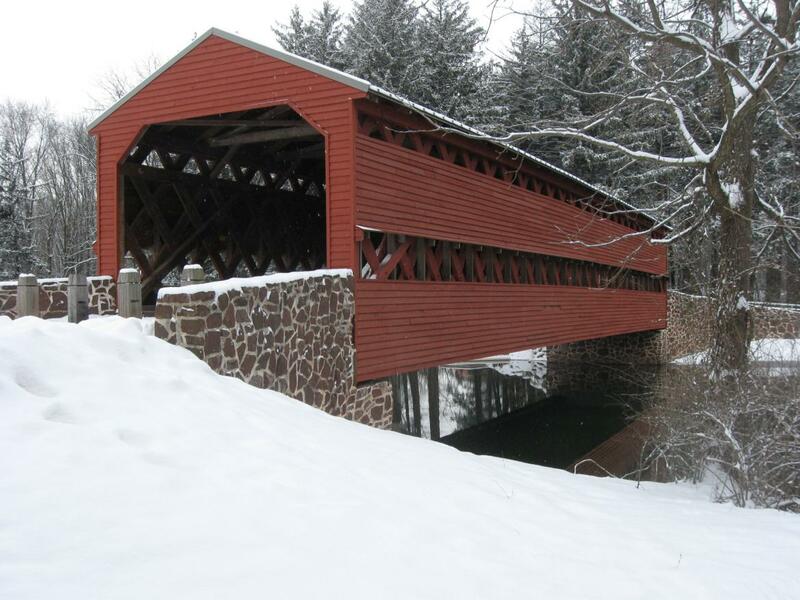 Covering bridges protected their structural members/underpinnings, thus extending their life to 80 years or more. This view was taken facing northwest at approximately 9:00 AM on Thursday, December 31, 2009. This view was taken facing northwest at approximately 9:00 AM on Thursday, December 31, 2009. 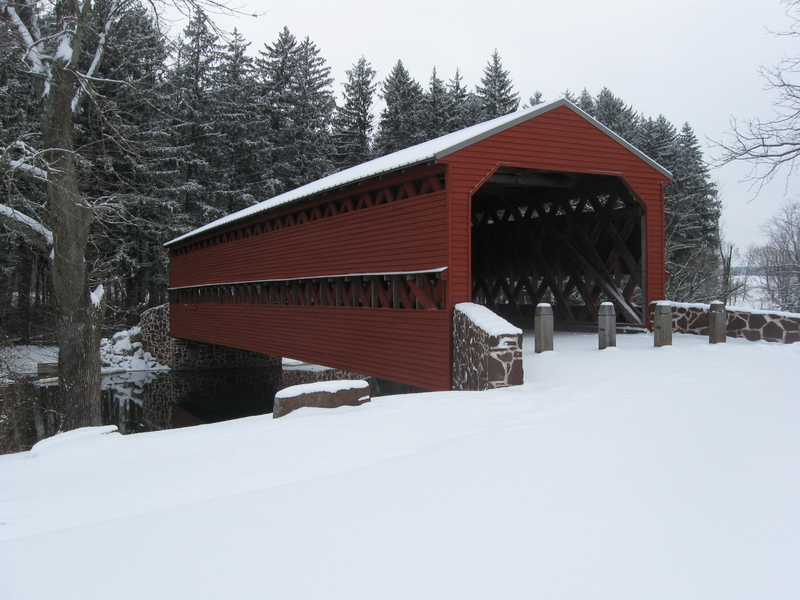 The Sachs Bridge was closed to automobile traffic in 1968. This view was taken facing northwest at approximately 9:00 AM on Thursday, December 31, 2009. This video shows you that although the still pictures make this snowy day to appear to be a quiet scene, its really not. 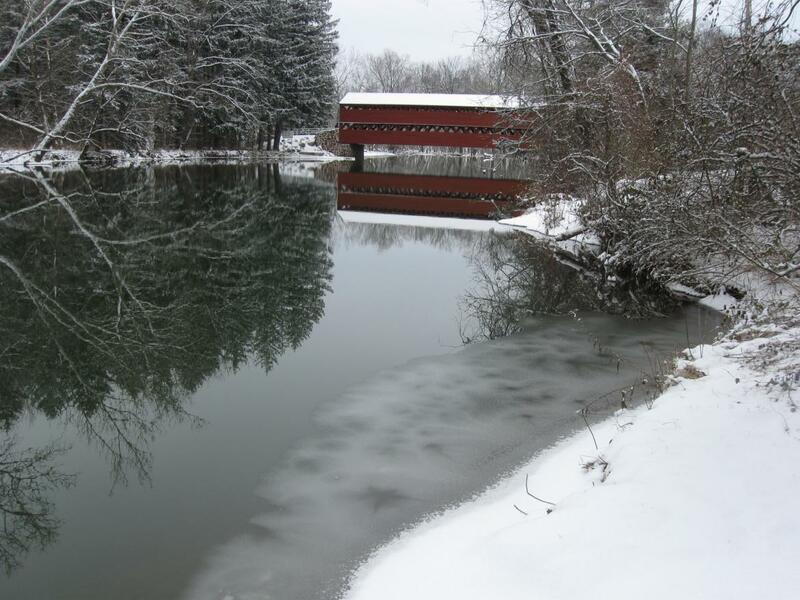 The 16 inches of snow that we received the week before began to melt, and the runoff was swiftly, and loudly running over the spillway. This view was taken facing northwest to south at approximately 9:00 AM on Thursday, December 31, 2009. We’re now on the northwest side of the bridge. This view was taken facing south at approximately 9:00 AM on Thursday, December 31, 2009. 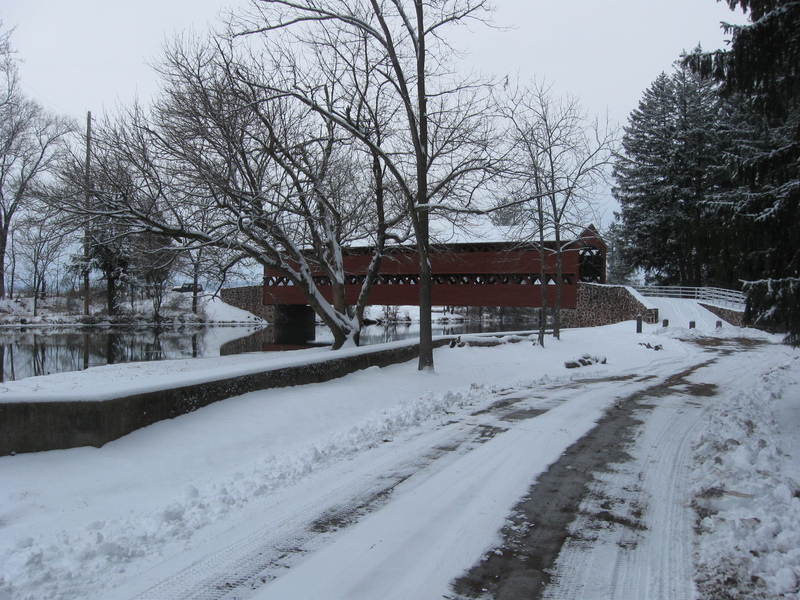 A 1996 flood swept the bridge from its abutments. 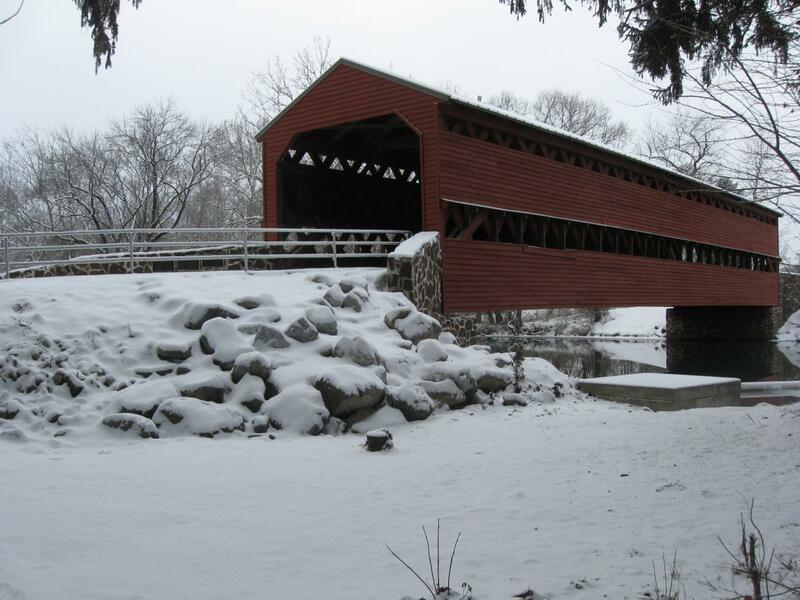 It was rebuilt by supporting the trusses with steel beams, and raising its elevation by three feet. This view was taken facing southeast at approximately at approximately 9:00 AM on Thursday, December 31, 2009. 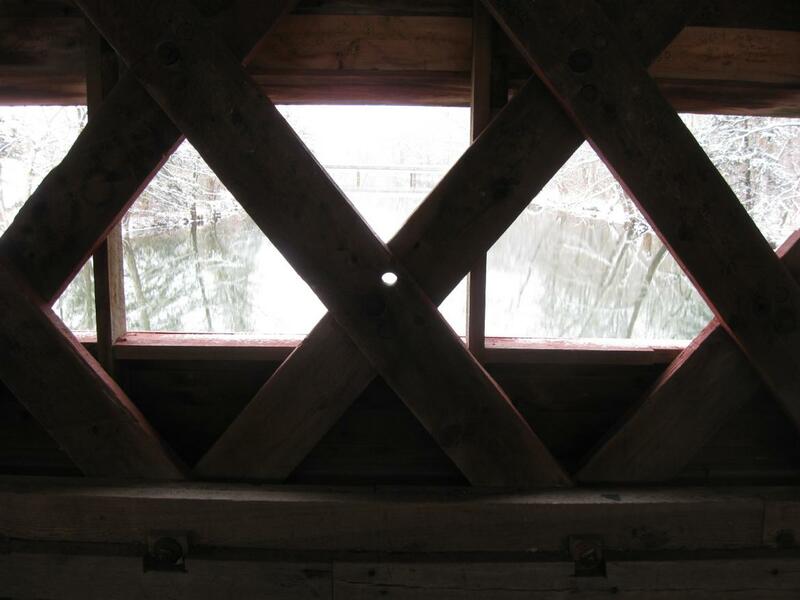 During the rehabilitation, approximately 90% of the original wood was retained. We’re now on the southeast side of the bridge. This view was taken facing north at approximately 9:00 AM on Thursday, December 31, 2009. 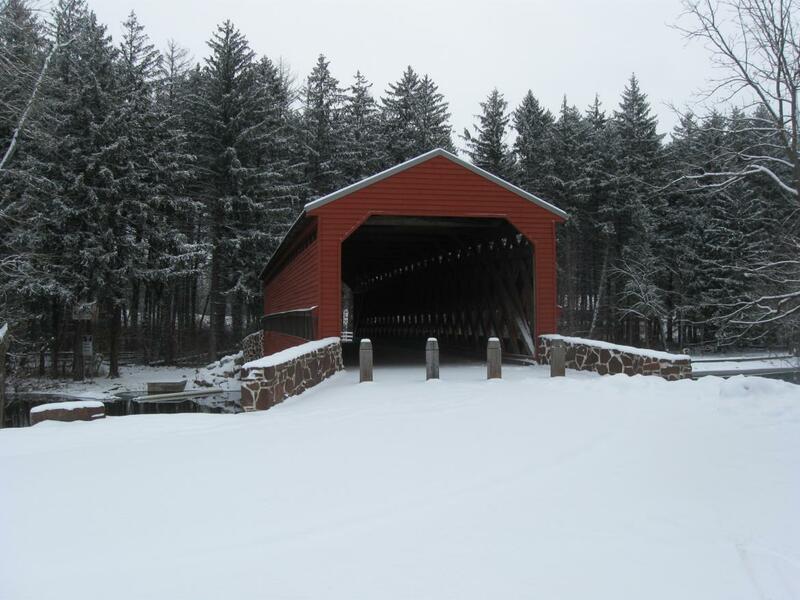 There are three covered bridges remaining in Adams County, and approximately 200 are still standing in the Commonwealth of Pennsylvania. This view was taken facing north at approximately 9:00 AM on Thursday, December 31, 2009. We’re now west of the bridge. This view was taken facing east at approximately 9:00 AM on Thursday, December 31, 2009. 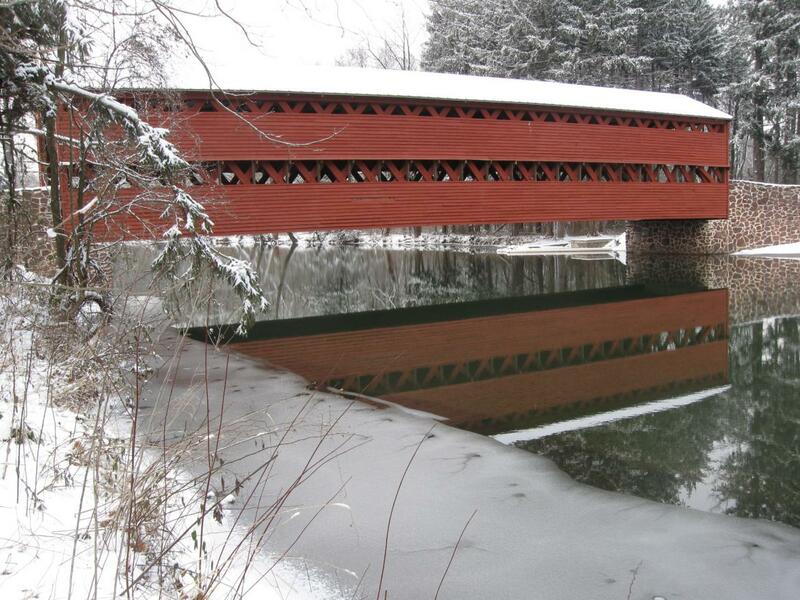 The Sachs Covered Bridge is approximately 100 feet long. This view was taken facing east at approximately 9:00 AM on Thursday, December 31, 2009. We’ve returned to the Millerstown Road/Pumping Station Road bridge for this picture. This view was taken facing southeast at approximately 9:00 AM on Thursday, December 31, 2009.